Equipment - Just Beauty Products, Inc.
Equipment There are 2 products. Alfaparf Equipment Supermeches+ 14.1 Oz. (Powder Bleach for Extra Lightening). Enriched with the innovative TJ Complex and Creatine. Lightening up to 7 levels. Blue aspect to neutralize unwanted brassy tone. 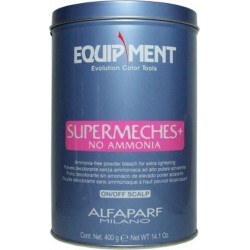 Alfaparf Equipment Supermeches+ NO AMMONIA 14.1 Oz. Alfaparf Equipment Supermeches+ NO AMMONIA 14.1 Oz. Ammonia-free Powder Bleach for Extra Lightening. Ideal for all lightening techniques. Lightening up to 7 levels.